The summer is synonymous with sunny beaches, light showers, a very blue sky, and sunbathing. Your goal this summer might be to get yourself exposed to as much sunlight as possible, but even then there would be times when you just need to get out of the sun for a while, right? That’s where beach canopies come in. Whether you intend on using the canopy for recreation or a family function, having the best beach canopy to compliment the event would make all the difference. The entire idea behind the beach canopy is to facilitate a temporary shelter, intended to create a space for friends and family to enjoy, such as for use on the beach or at the park or at sport line events. A good canopy is one that can shield the people inside from the elements such as sun, rain, wind and yes, the dreaded pesky bugs. It is also a plus if the canopy is affordable, portable, easy to setup and teardown, durable, versatile, and stylish. You might be wondering by now whether such perfect summer shelters really exist or not. They are not easy to find, but you can rest easy now that you have enlisted our help. We created this article so you would have an easier time finding the perfect beach canopy for you. First, we’ll list the factors you should take into consideration when purchasing a beach canopy. After that, we’ll move on to the top 7 products currently available on the market. We know that there are so many types of beach canopy available on the market, vying for the opportunity to make it into your homes and your families, that it’s difficult to make a practical and smart decision on the best beach canopy. To narrow down your options, here are several important factors that determine the quality and functionality of a beach canopy. We suggest that you consider a few with outfitted walls with mesh screens and durable materials as two of their main selling points if not two of their best features, potentially on all sides where possible and if desired. Mesh screens are important because they are the main determinant of how breathable the shelter will be. Mesh windows allow for air ventilation while keeping unwanted things—such as pesky bugs—out, so they are important. How durable the main materials used are also important. Pay an especially close attention to what kind of fabric makes up the main body of the canopy and what kind of material the poles and frame are made of. Nylon and PE are two of the most commonly used fabrics. Of course, nylon is tougher than PE but it’s also more expensive. You should pick the best one for you according to the budget you’ve set aside for purchasing a beach canopy. As for the poles and frame, steel and fiberglass are two of the best options available today. Canopies with a steel frame would typically be heavier—which can be a good thing if you plan to pitch it in a windy area. Canopies with fiberglass poles are lighter but no less tough. If you prioritize a low price, there are also canopies with plastic poles. The shape of the canopy is an important factor because it usually has some kind of impact on how durable the canopy is and how well it can handle harsh elements. For example, a dome-shaped shelter would be able to protect you against the rain better. The same can also be said for canopies with an awning. On the other hand, canopies with a shape that’s more streamlined should be able to handle the wind’s battering better. Also, since the topic of this article is about beach canopies, chances are you’re planning to use the canopy during a beachside vacation. In that case, how well the canopy can protect you from the sun’s direct rays is also important. Based on the canopy’s actual function, you can consider some of the best beach tents on the market which have four walls, three walls or no walls at all. It’s probably quite obvious, but we’d like to remind you again to pay attention to the size of the canopy because it determines its capacity or how many people you can fit inside of it. In getting a better idea of which size would better suit your needs, you should consider the footprint. Canopies that have a footprint of around 100 sq. ft. or more would be considered quite large as they can host 6 to 8 people at a time. Canopies 70 sq. ft. or less should be able to house up to 3 adults and perhaps several children. Any smaller than that, and you should limit the number of adults you invite to the event down to two. If you are a family with kids and you don’t think that you’d get much help while pitching the canopy, you should pick a pop-up tent that can be set up in one minute or perhaps even less. As the name suggests, all you really have to do is take the canopy out of the carrying case and it would pretty much do the rest itself. One disadvantage of using pop-up tents is that packing it away is typically much harder than pitching it, although this is not always the case. If you are a group of adults and everyone is used to pulling their weight when it comes to preparations, then how difficult the tent is to set up might not matter all that much to you. In that case, you should go for a canopy that requires some assembly. These might take 10 minutes or more to pitch, but they are usually easy to put away and are more durable. Protection here refers to UV light, rain, and wind protection. Materials that can provide 50+ UPF UV light protection is typically the norm when it comes to each canopy. Any lower than that and the UV protection wouldn’t be enough to keep you nice and cool while you’re out there on the beach at the height of summer. As for rain protection, you’ll want to make sure the materials are water-resistant especially if you plan to take the canopy with you on an outing to the mountains. Last but not least, a beach canopy has to exhibit a certain level of wind-resistance. Canopies that are wind-resistant are made from durable materials so they would not crumble easily even if harsh winds blow on them. To enhance the wind resistance capacity of your canopy, you can also stake it to the ground. Now without further ado, let’s take a look at the canopies which topped the charts for most if not all of the key traits listed above. Description: The Coleman Mountain View Dome Shelter is a 12 x 12 dome-shaped beach canopy that is very easy to set up. With two people, you should be able to pitch it in 10 minutes. Although, if you’re working alone, set aside thirty minutes to one hour depending on how used you are to pitching canopies. Once your shade configuration is set up, you can also zip up any of the four screen walls to keep out the bugs. One really great feature of this tent is that its four mesh walls can be completely removed to allow a group of people to move in and out of the tent with ease, say for example if you had a picnic table set in its center and was serving buffet style. However, if you have a smaller group where the guests would be sitting around the picnic table and you wanted to keep them out the bugs and the sun, then zip on all mesh walls for that ultimate protection. For versatility, spaciousness, style, and functionality, this tent is a definite great buy. 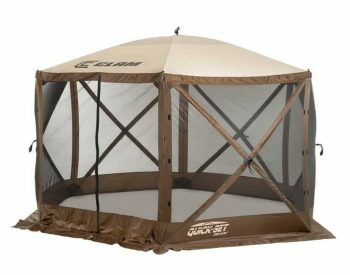 This shelter is well-designed and will adequately protect you from the sun’s rays due to the 50+ UPF sun-proof fabric. On the other hand, aside from the fabric, it seems like the materials used to construct this canopy are not all that durable. Keep in mind that this tent was not really meant to be slept in, although some of you may be tempted to use it for this purpose. For that, you’ll need a family-sized tent. Related: This is the perfect canopy to use if you plan to hold a summer picnic event due to its removable mesh walls. To ensure the success of such events, the presence of this Coleman Pack-Away Deluxe Kitchen is pivotal. With this compact kitchen set, you’ll never have to worry about running out of food to put out. Description: If you plan to hold an event that would host around 6 to 8 people during the less-friendly times of the year when rough winds or rain could show up to crash the party unannounced, the Clam Corporation 9879 Escape Shelter would ensure that your event goes off without a hitch. It’s built tough with thick fiberglass poles and durable 50+ UPF UV poly-oxford fabric, so there’s no need to worry that the canopy would crash down upon you and your guests during the party. The roofs are said to only be water-resistant instead of waterproof, but they actually hold up really well in the rain. This canopy also comes with mesh walls that would keep the insects out effectively. On top of that, it’s super easy to set this thing up. True to its promise, you should be able to pitch it in one minute or less. This is the perfect canopy for those of you who have no choice but to work solo. Although this tent is well-designed, there is one flaw that you should take note of. Its 94 sq. ft. floor space is designed to fit a standard-sized picnic table, but it’s quite difficult to move the table in without doing damage to the mesh walls. Related: You should purchase this Clam 9898 Wind Panels if you plan to hold your event in a really windy area. You don’t want the wind to show how uncooperative it can be and blow all of your carefully-crafted decorations and stuff away. Description: The Compaclite Shade and Shelter is a wonderful choice for those of you who’d like to be able to relax by the beach without being bothered by the heat or excessive sunlight. Thanks to the UV 50+ UV Guard fabric, even the harsh sun’s glare that usually accompanies beach trips wouldn’t bother you that much. This shelter offers an amazing value for money. It’s affordably priced and it even comes with useful extras such as two chairs. These chairs are quite solid and are designed to withstand a weight of up to 220 lb or more. But the legs of the chair are quite sharp and might poke through the cabana’s PE flooring if left as they are, so you might want to rectify that by placing a makeshift cushion underneath each leg. The PE flooring isn’t the most durable of them all, but the rest of the shelter is made from suitably high-quality materials. The frame is made of steel and the poles are fiberglass. They can surely withstand even the occasional harsher oceanic breeze. Taking about 5 minutes to set up and take down, this cabana is the perfect option for those of you who’d like a quick pop-up shelter. Related: If you’re taking your kids on an outing to the beach, consider purchasing this Prextex Beach Toy Set. Pitch the cabana, spread these toys on the floor, and your kids would have a field day as they cool off and play under the protective shade. It’s as simple as that. Description: The G4Free Portable Beach Tent is an amazing shelter for a group of 2 to 4 people. It is quite spacious for a mid-sized tent, although unfortunately, it doesn’t leave a lot of headroom, especially if you’re an all-adult group. The good news is, if you’ve got kids in the group, this is basically the ideal tent. The no-hassle pop-up system means that even kids would have no problem pitching this tent. It is a wonderful learning experience. You might have to supervise them at first, but once they get used to it, they should be able to do it in 2 minutes or even less. Unfortunately, collapsing and folding away this tent is not as easy as putting it up as the instructions were not clear and quite confusing. This tent is also not made from the most durable materials and the stakes may bend when you pitch it—although they’re quite flexible and should still work well enough even bent. 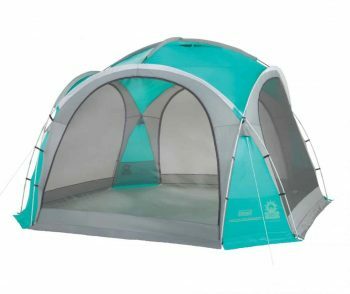 Despite all that, this tent is quite functional and can come in handy when you have a sleeping child or infant or person who needs a spot to rest away from the scorching sun. You won’t be missing out on anything if you purchase this. Related: This tent comes with a flooring of its own, but if you prefer to have more layers between you and the ground, you might want to purchase this Camco Handy Mat too. This mat will be especially useful if you plan to pitch the tent during a mountain hike where the available grounds are often rocky or uneven. 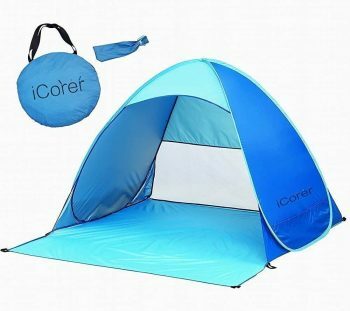 Description: The flame resistant nylon fabric in iCorer Automatic Pop Up Beach Tent is its core selling point. This makes it safe for you to cook inside. This feature makes it a good choice for a day camping or hiking trip—although it’s not a suitable option for long-distance hikes because it is quite small. The size is ideal for one adult with children or maybe two adults, but any more than that, and it would get really cramped. The small size makes sense, though, because this is a pop-up tent. Setup is really simple. 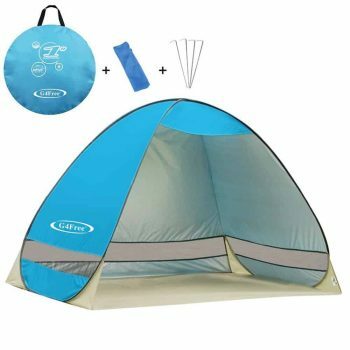 Basically, all you have to do is take the tent out of its carrying case and it would practically pitch itself in one minute or less. Unfortunately, closing it back up after use is a different matter. It’s quite difficult and would definitely take some getting used to. You’ll want to do it carefully and slowly because you do not want to risk bending the wires. The item will be rendered unusable after that. The frame is made of steel and the pegs themselves are basically quite flexible. Unfortunately, the wires are not and it’s quite the design flaw. 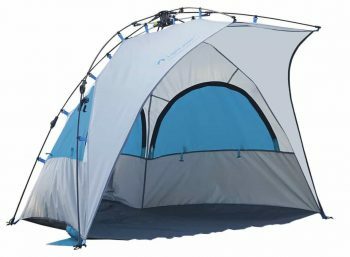 Related: If you plan to use this tent on a beachside trip at the height of the summer, you might get overheated because this tent depends on a single mesh window at the back for ventilation. Although the window is quite large, it’s not enough when it’s really hot. Times like that, this O2COOL 5-Inch Portable Fan would definitely be a huge help. 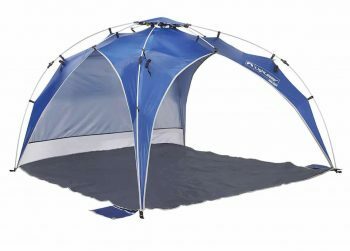 Description: The Lightspeed Outdoors Quick Beach Canopy is quite spacious. It can handle a group of 4 adults easily although you might want to reconsider the headcount if you plan to add chairs or a table inside. It offers 270-degree views and three openings for maximum ventilation. Though it is most popularly used for sideline sports and recreation, it is also perfect for the beach, trips to the park, and just about anywhere that you need protection from the sun, the wind, and rain. Setup is relatively quick and easy. First timers should be able to do it in 20 minutes or less as long as they read the instructions properly, and once you’ve gotten the hang of it, you should be able to pitch it in 10 minutes or less. Unfortunately, this canopy is not very durable. It doesn’t do well in windy areas due to its rather fragile plastic poles and the quality of the fabric is questionable as well. Despite all that, this canopy is still a suitable choice for areas with a milder climate. It also provides the users with adequate protection against the rain thanks to the 450 mm PU coating. Related: This canopy isn’t the most durable so it’s not all that suitable for windy areas. The fabric won’t rip that easily but the poles are made of plastic so they’re very light and the entire canopy may end up flying away from you if the wind is strong enough. But if you stake it properly with this Orange Screw Ground Anchor, it should hold up well. Description: Using Lightspeed Bahia Pop Up Shelter’s quick pop-up system, you should be able to pitch easily it in less than one minute so you’ll be able to skip the hassle and get to the fun stuff as quickly as possible. If you are considering this tent for your next family recreation event, you’ll find yourself attracted to its look, ease of setup and teardown, and also its uses for so many occasions and locations. Most pop-up shelters are easy to set up but difficult to fold back down, but that’s not the case with this one. It’s easy all around. The durability of this shelter is also a considerable selling point. Its fiberglass poles are able to withstand even the windiest weathers and its PU-coated fabric will keep you dry even when it’s raining hard around you. It also comes equipped with an awning for extra rain protection. This shelter is great for rainy areas such as the ones you would typically encounter on a hiking trip, but other than that, it’s also perfect for a weekend trip to the beach. Three zippered windows make sure that you won’t get overheated even if you take a nap inside this canopy when the sun is still high in the sky. Unfortunately, this tent doesn’t have a lot of floor space to offer. Two adults are the limit—three would be crammed shoulder-to-shoulder. It’s the perfect size for one adult with one or two kids, though. 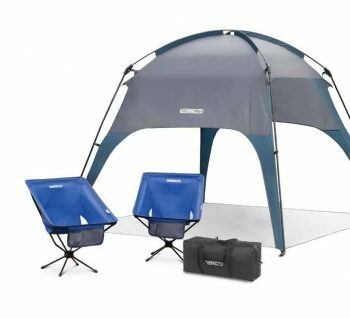 Related: If you’d like to be able to relax comfortably under the cool shade of this tent while on a beach trip, you should purchase these Lightspeed Outdoors Lounger Park and Beach Chair. They are a perfect size and should be able to fit inside the tent no problem, although they don’t leave a lot of space for everything else. So there you have it, folks. The top rated, most sought after, most liked, best-reviewed canopies on the market of 2018 all in one place. We’ve done the hard work for you, so the only thing left to do is to decide which one or which ones should become members of your family. We have no doubt that they’ll become part of your everyday routine which involves a family or couple get together. All of the canopies we have reviewed above provide adequate protection against the rain, wind, and sunlight. Since that’s what people typically look for in a beach canopy, you can be sure that these shelters would be able to fulfill your needs. What type of canopy do you like best and which one do you have for yourself? Do you have more than one that you use for different purposes? Are there any other canopies that you would like to suggest to fellow beach-goers? Let us know in the comments section underneath!